As the nation marked the 50th Anniversary of the March on Washington, the Lower Merion community honored the anniversary of an important local chapter in civil rights history -- one that changed our schools forever. In 2013, community members gathered for The Moment of Integration: The 50th Anniversary of the Closing of the Ardmore Avenue School. The program included the dedication of an historical marker at the site of the Ardmore Avenue School at 75 Ardmore Avenue and a symbolic walk to Lower Merion High School where a formal ceremony and several informational presentations were held. 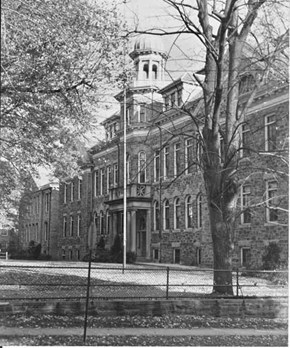 The Ardmore Avenue School, built in the late 1800s, was one of the first elementary schools in the township. As the Civil Rights Movement grew in the 1960s, there was increasing concern that the school, which had fallen into disrepair, was both segregated and inferior to the other schools in the District. In August 1963, the Board of School Directors voted to close the school and reassigned its 223 mostly African-American students to four other elementary schools, marking the beginning of the true desegregation at the primary level in Lower Merion. At the time, there were only a handful of African American students in the District's other elementary schools. Most white students in Lower Merion did not attend schools with an African American peer until they arrived at junior high school. A large team of staff, students and alumni coordinated a variety of programs related to the Moment of Integration, including a documentary film highlighting student life at the Ardmore Avenue School, a wall mural at LMHS depicting important moments in the local and national Civil Rights Movement, an oral history video compilation, a series of stories for school newspapers, a virtual history museum for the District website and a student-written play based on the events of 1963. 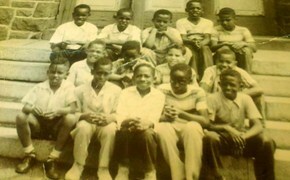 Students at the south entrance of Ardmore Avenue School circa 1957. 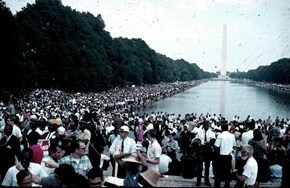 1963 March on Washington D.C.